PowerSchool is a Student Information System (SIS) that integrates with School Data Sync (SDS). Using the PowerSchool sync method, you can connect directly to your SIS using the REST-based APIs provided by PowerSchool, and synchronize data directly instead of using CSV files. To set up SDS using the PowerSchool Sync method, follow the instructions detailed in this article. Before SDS can access data from your PowerSchool SIS, you must install the application plug-in below within PowerSchool and obtain OAuth credentials following these steps. On your local computer, create an XML plug-in installation file with following content, and save the file as "plugin.xml". Sign in to the PowerSchool admin portal website using your System Administrator credentials. Enter or select the plug-in installation file you just created (.xml), and then choose Install. The plug-in will appear in the Installed Plugins section on the Plugin Management Dashboard page. Make sure the plug-in is enabled. If it is not, choose the Enable option on the Plugin Management Dashboard page. On the Plugin Management Dashboard page, make sure that the plugin is enabled. Choose Data Configuration to view the OAuth credentials that were generated for the plug-in. Record the values for the Client ID and Client Secret so you can enter these credentials when you create your School Information Sync profile. 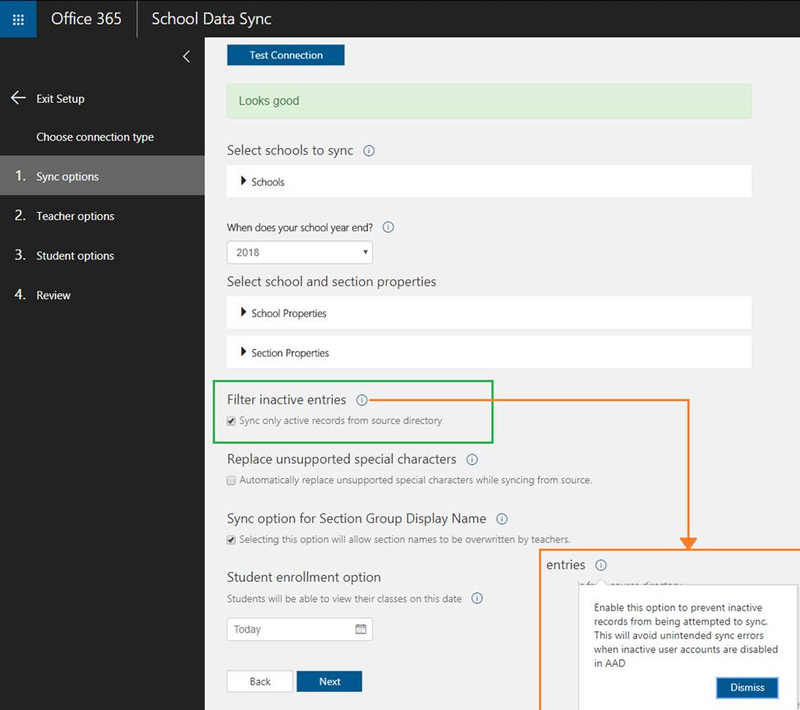 Microsoft School Data Sync must be able to reach your school's PoweerSchool server. To make sure the server is accessible, open ports 80 and 443 from the Internet to your Powerschool server. To validate that the endpoints are set correctly, check that you can open the PowerSchool server website pages from the Internet. For example, in your browser, go to (https://Powerschool.com/public/) and (http://Powerschool.com/public/). 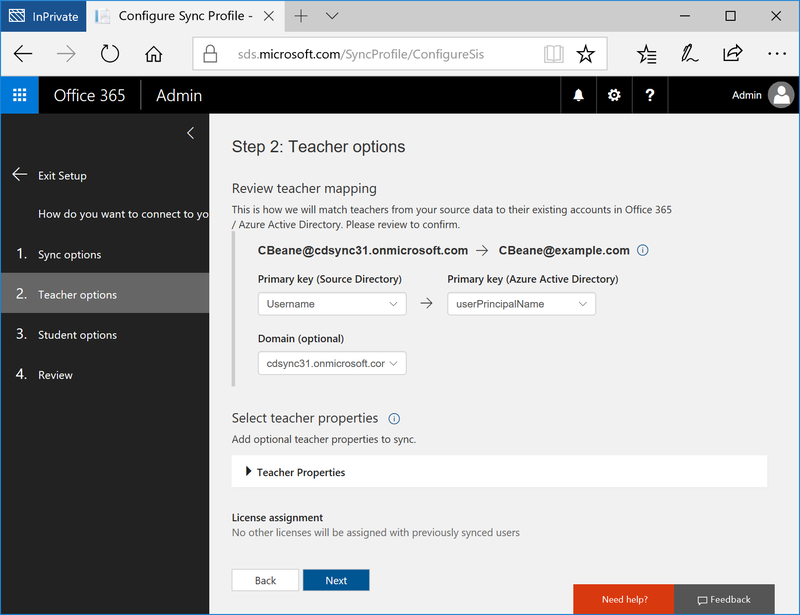 If you are configuring School Data Sync for a tenant which is synchronized from onpremises Active Directory through AADConnect, you may notice an increase in the number of Disconnectors shown in your miisclient. This is a result of Office 365 Group being unable to synchronize back to the AADConnect Metaverse and on-premises Active Directory. These warnings do not have any negative impact on your current AADConnect deployment, and only provide an informational note on the resultant sync failure. 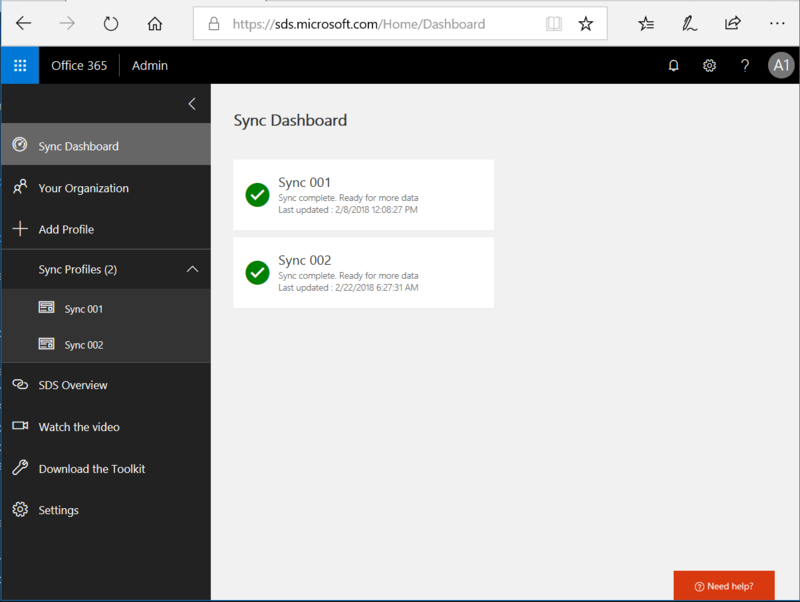 You should expect these warnings in AADConnect after enabling sync in SDS, as one Office 365 Group is created for each class synchronized through SDS. 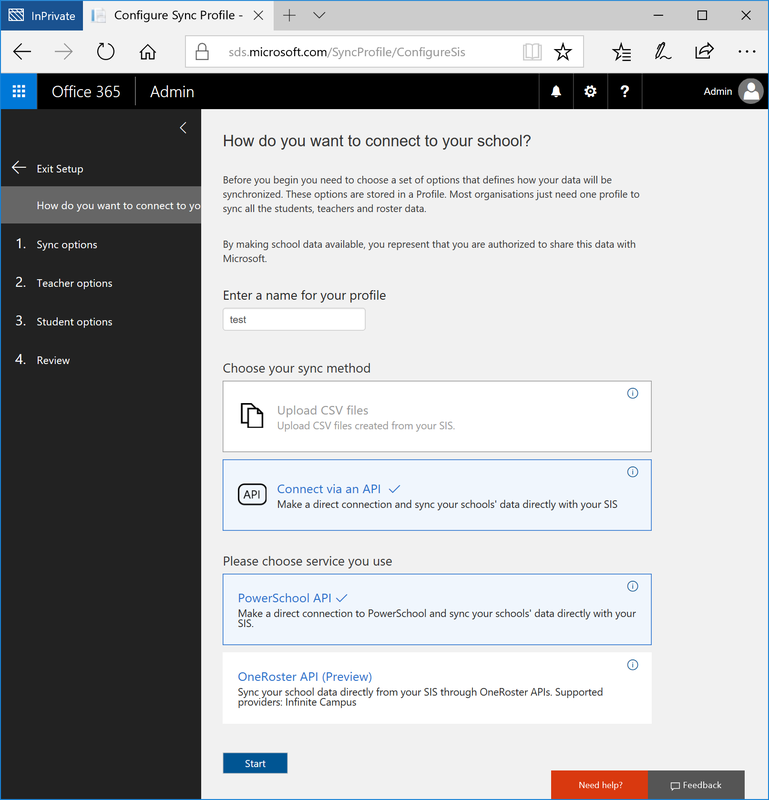 To access the School Data Sync Admin Portal launch a web browser, navigate to sds.microsoft.com, and then sign in using your O365 Global Admin account. 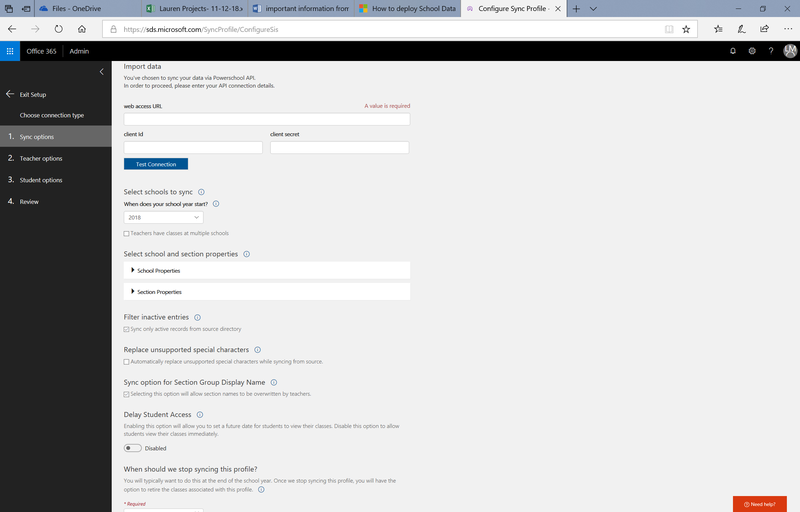 After logging in, click +Add Profile in the left hand navigation pane to create a Sync Profile. Choose your sync method - Choose between the sync methods shown. If you’re syncing using PowerSchool API, select the Connect via an API box and then select the PowerSchool API option. On the Sync Options page, select the appropriate option to create new users or sync existing users. Then complete your selections on the page as appropriate. Existing Users - Select this option if you already have user accounts create within your O365 tenant for each of the students and teachers contained within PowerSchool. New Users - Select this option if you want SDS to create user accounts for each of your students and teachers contained within PowerSchool. Web Access URL - This is the base URL for your PowerSchool SIS which is Internet accessible. client Id - This is the client Id recorded in the Install the REST API plug-in for PowerSchool section of this article. client secret - This is the client secret recorded in the Install the REST API plug-in for PowerSchool section of this article. Select schools to sync - This option allows you to select the school you want to sync from PowerSchool. When does your school year start? - This is the school year from PowerSchool you wish to sync under this profile. Only 1 school year can be synced per profile. Teachers have classes at multiple schools - If you have a teacher or student associated to more than one school within PowerSchool, check this box. School properties - These are the school attributes contained within PowerSchool that SDS can sync. The greyed out attributes are the required attributes, and must be present in PowerSchool for each school to sync. The additional attributes shown are optional, and can be synced if you choose. Section Properties - These are the section attributes contained within PowerSchool that SDS can sync. The greyed out attributes are the required attributes, and must be present in PowerSchool for each section to sync. The additional attributes shown are optional, and can be synced if you choose. Filter inactive properties - Checking this box will only sync active records. Replace unsupported characters - Checking this box will automatically replace unsupported characters with supported ones. When should we stop syncing this profile? - You will typically want to do this at the end of the school year. Once we stop syncing this profile, you will have the option to retire the classes associated with this profile. Primary Key (Source Directory) - This is the Teacher attribute in PowerSchool used for SDS Identity Matching. Watch the Identity Matching video for additional information on how to select the appropriate source directory attribute, and properly configure the identity matching settings for teacher. On the Student options page, select the appropriate identity matching options, confirm the student properties are selected, and then click Next. Primary Key (Source Directory) - This is the Student attribute in PowerSchool used for SDS Identity Matching. Watch the Identity Matching video for additional information on how to select the appropriate source directory attribute, and properly configure the identity matching settings for teacher. On the Review page, ensure you've made the appropriate selections. If no additional changes are needed, click Create Profile. Students and enrollments – SDS syncs some students based on school association and status. Teachers – SDS syncs some teachers based on school association, and staff type. Classes and Schools- SDS syncs all within the selected school year.